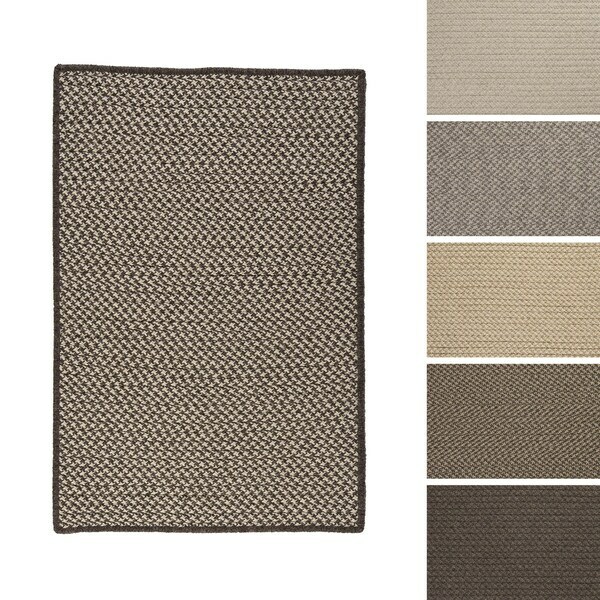 Protect your flooring in ideal style with this crisscross all-natural wool braided rug. Offering a houndstooth pattern, this rug is eco-friendly, reversible, and for indoor use. "Is mthe cocoa color dark? Another reviewer said it was more like a "light cocoa brown". It looks like dark brown mixed with black on the site? Also, is the espresso BROWN and CREAM??" In my opinion it is a medium brown. "Is the cream tea color a mix of cream and tan? Is the lightest color ivory mixed with grey??" You can see the images listed with their color names by clicking through the image carousel. We try to represent the colors of our products accurately in the images on our site however, due to the difference in monitor colors, some colors may vary slightly from what you see on your screen. "Is the latte color grey or brown? Is the espresso color black or dark brown?" You can see the images with their color names by flipping through the images carousel. In my opinion, these rugs are a mixture of taupe and brown and are not black in color.